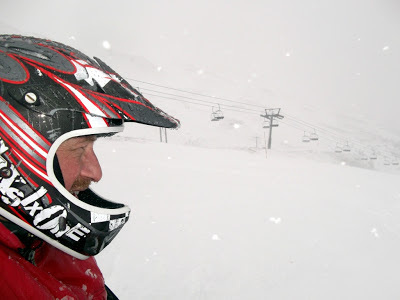 With no plans for further snow based adventures this season (but I am open to offers) it is time to take stock of how the 2012-13 skibike season has turned out. Things started off somewhat shakily as my car developed mechanical ailments with just days to go before my Christmas Eve departure. Some of them continued to plague me on route, I even ended up doing some MacGyver car park repairs on Boxing Day that, luckily, kept me going for another 1000 miles. Upon my arrival to rendezvous with Carl Day for a few days warm up session, although there had been a lot of pre-Christmas snow, there was somewhat of a heat wave, it was even raining on day one, I was wetter than an otter's pocket. 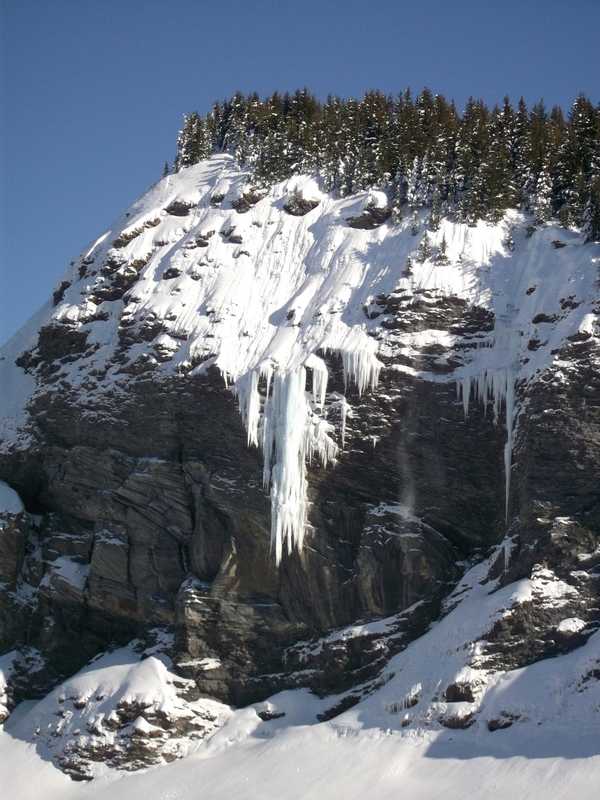 Repeated freeze-thaw cycles lead to some brutally icy runs down to Les Carroz and I had some quite unerving falls including one that really nerfed my wrist badly. There were no such problems for Carl Day who was having a ball on his Lenz Brawler. We met up with Mel who had bought Carl's old skibike and a couple of days later we managed to ride en masse with local skibikers Serge Mermillod and Thierry Avrillon. After Carl's return to the UK, I took some time off for good behaviour to give my body a chance to repair. Then I stayed local to Geneva and enjoyed some great riding in the Jura mountains to the North of Lac Leman. 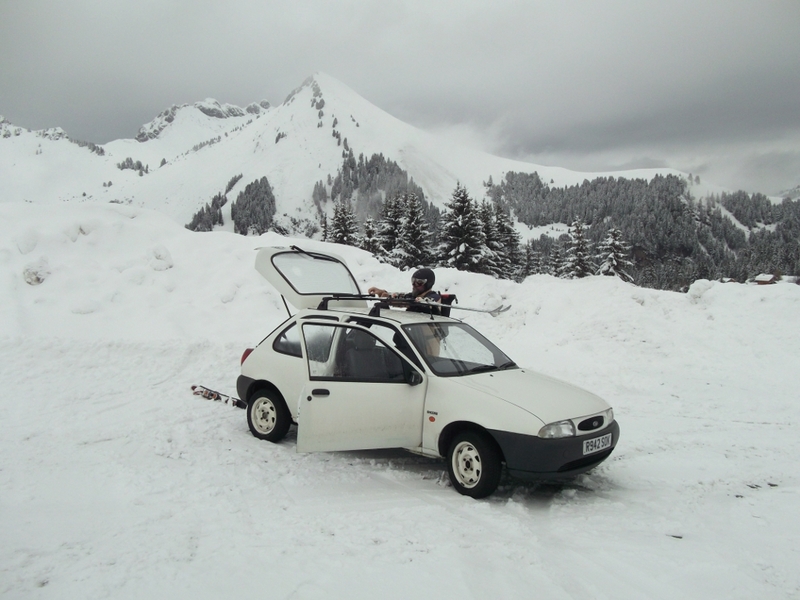 I had the chance to give my original DIY skibike a test at Le Grand Bornand, but found some aspects of the recent upgrades to the conversion sadly lacking. I had to work hard to find the sweet spot where my riding skills would work homogeneously. Staying in the Jura mountains, I visited the pleasant runs to be had at the Col de la Faucille. But then switched to skis for a loop around the Roc d'Enfer loop in the Portes du Soleil and switched back to the skibike for a terrifying descent down its face. Exploring the South side of Lac Leman it was a skis only day at Thollon les Memises with some stunning views over Lac Leman. I eventually reached breaking point, finding the limits of both myself and some of the components I use on my skibikes. I made a few attempts to rendezvous with skibiker Fabrice Mercier and twice had to make a change to plan B, including an unexpected return to Avoriaz. I was starting to become frustrated by 10 things I absolutely hate about France. 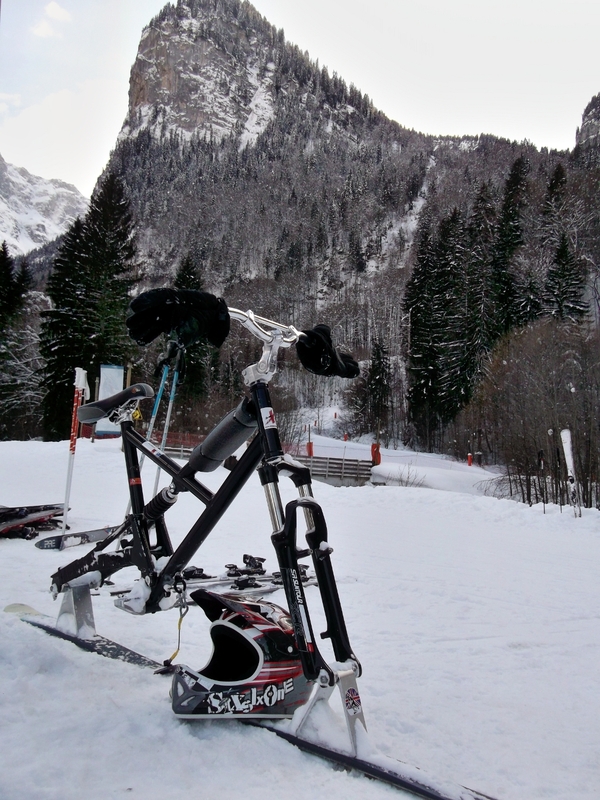 But on a stormy day, I crossed the snow line and Fabrice and I rode together at Les Carroz. 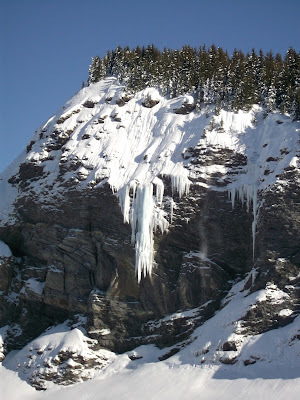 Switching back to skis, I visited Bernex and the Dent d'Oche. After that I decided "Ca plane pour moi - That's enough for me" and headed home, but it was not to be for long. A rendezvous with Fabrice Mercier - finally! Back in London, I had a chance to consider 10 things I truly love about France, I rode my RetroBike around London on the snow, did a little urban skiing and organised a complex plan for February, I love it when a plan comes together. I met up with Carl Day and Andy Upsullon in Flaine for a few days of non stop skibike riding in all types of weather. 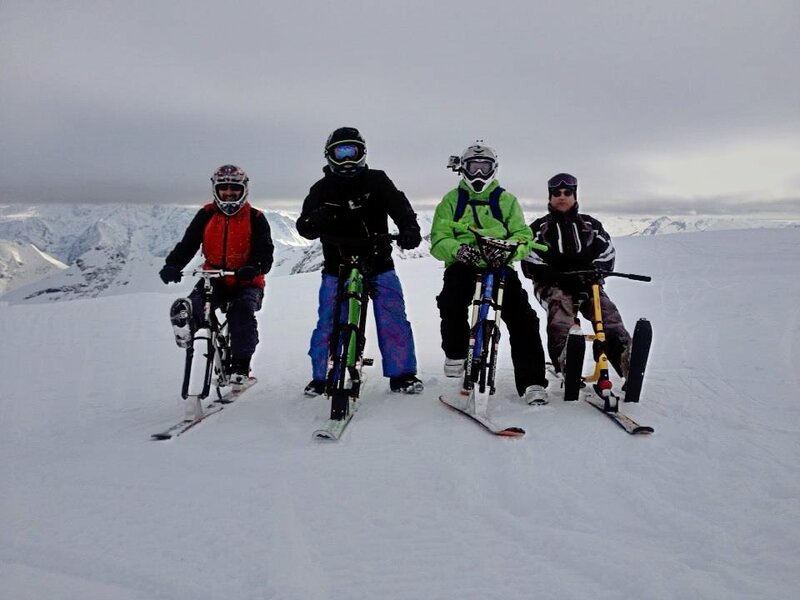 Old skool met new skool when SAGB chairman and skibob rider Ric Platt joined "the weirdos who ride without footskis" for a tour around the Grand Massif. 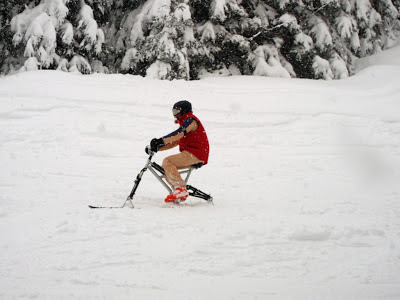 But I think LenzSport skibikes are for fair weather riders, as the boys chickened out when the weather got really rough! After that I moved down the hill to a rented flat in Cluses which I shared with my cousin Paul starting his retirement. He thought he could take it easy, but on the first day of his holiday he had to hang out with the crazy skibikers at Avoriaz. With the arrival of much colder and stormy weather we struggled through a foggy day in Praz de Lys and discovered that you have to know your Onnions! when it is snowing like La Glappaz. 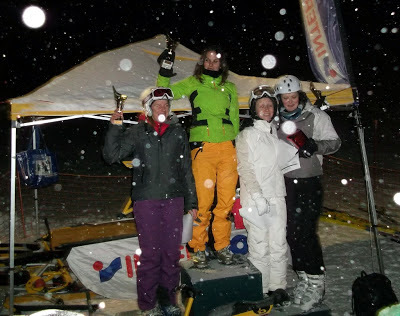 I took part in the first SnowBike Race Night at Notre Dame de Bellecombe and both Paul and I liked the area so much that we came back the following morning and skied Praz sur Arly and the Val d'Arly loop. I had a family reunion with my sister in law and niece and the next day the SkiBiker turned into a ski instructor. This lead to a crisis of confidence about my desire to continue skibiking, but my cousin Paul's first skibike lesson turned things around and I got my mojo back. I then revisited Les Contamines and managed some great riding till the piste patrol pointed out that it was a forbidden practice, oops! 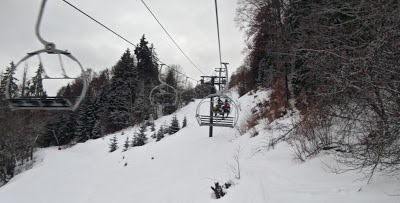 The following day I revisited Praz de Lys and Sommand, found that they are still skibike friendly, even if the liftie thought it was dangerous to ride without footskis and enjoyed some of the best off piste riding of the season. My final visit to the Grand Massif invloved an epic ride along The Cascades 10 mile skibike run, possibly the first freestyle skibike ever to make the run? Then it was a switch back to skis to do the Val d'Arly loop once again, but this time in the reverse direction. 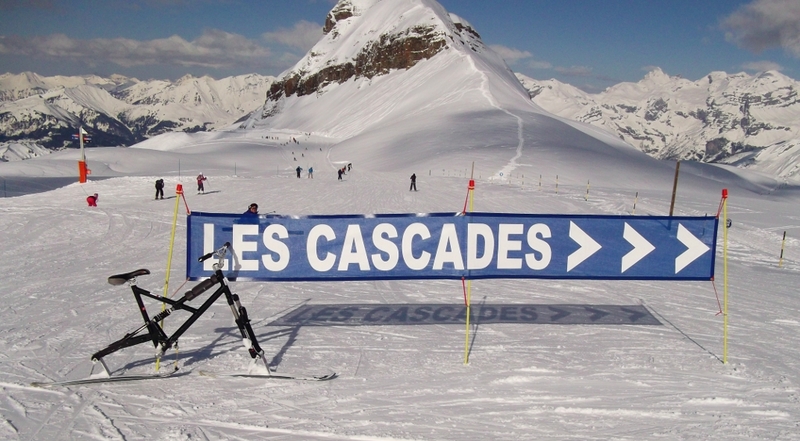 Les Cascades - the first freestyle skibike ever to make the run? Carl Day for his relentless enthusiasm, Andy Upsolon for sagely advise, dry humour and a very neat "I love skibikes" T-shirt and ro Ric Platt for some great stories from back in the day. To Serge Mermillod and Wayne Richards for pushing me into the whole pegger/freestyle method, Thierry Avrillon for heading first down the "cacahouettes" Crazy Crozats run, Fabrice Mercier for getting back on his skibike in spite of what happened last season and to Mel for giving it another go on one of the busiest pistes, on one of the busiest days of the season. To James Mollier, Vincent Berod and the other Brenter riders of the Val d'Arly for letting me have a go at their race in my own unconventional manner. To the "clan" members who took part; well done Sofia Kinnon for making it down 500m of vertical drop in total whiteout using just the snowplough ski method, thanks for the yummy Bolo Rei to her mum Isolette and thanks to my sister Colette Kinnon for the use of Geneva base camp alpha and use of a spare car at a second's notice. Lastly, to my cousin Paul for some fantastic high speed ski cruising and for keeping both feet on the pegs whilst trying out one of these skibike things. Could next season be any better? Every season there is one track that you hear played everywhere; in the bars, supermarkets and on the radio constantly. This time it was "Shine bright like a diamond" by Rihanna. Today it was time to leave our skibike base camp in Cluses and start heading for home. I saw Paul off onto the Geneva express coach then returned to the flat to clear out my stuff and pack the car. I then spent a couple of hours doing a top down tidy up before the landlady arrived to collect the keys. I have an overnight stay in Geneva, then tomorrow it's the long drive home and then the painful return to my "real" life. Paul and I discussed options for the last day of the season, he wanted another mile eating run. Having consulted various piste maps and consumed two Gin & Tonics he decided that, given a free choice, he would like to do the Val d'Arly loop again. I suggest we do it "back to front" or anti-clockwise relative to the piste map. It turned out to be perfectly feasible, although we noted a couple of disadvantages to this choice of direction. Firstly, you run along a lot of cold, North facing runs early in the day and get to see the South facing runs later in the day when they could be prone to slushiness. Secondly, a lot of the flatter, interlinking runs, are actually uphill in this direction, so extensive poling, walking or skating are involved. The Val d'Arly really is a gem, the piste plan makes the area look like a selection of little interconnected hills. But the reality is that some of these little hills have a 1000m of vertical drop and getting from one to the next can take up to an hour, even skiing at a good intermediate/expert skier speed. It might not be quite the scale of the 3 valleys, but it is close. The infrastructure is quite heavily biased towards drag lifts and the majority of chairlifts are somewhat vintage in nature. To a reasonable skier these lifts would present no problem, but for a ski novice, Brenter or SnowScoot rider they could be a bit of a challenge. 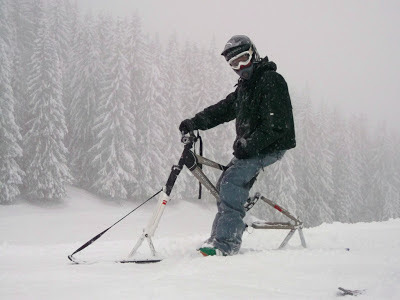 Although freestyle/pegger skibikes are not currently allowed in the Val d'Arly, even if they were, the choice of runs would be somewhat limited by the infrastructure. Paul has a jinx, every time he has visited the Grand Massif misfortune has befallen him, first it was the flu, then it was an awkward fall, so today it was time to remove the curse and do some mileage eating of epic proportions across the Grand Massif domain. Starting from the base station at Morillon, we were to make the grand tour through Les Carroz, Les Molliets and Flaine taking in all the many long cruising blue runs available. Then from the top of Les Grandes Platiers we were to follow the 14km Cascades run to leave us on the very limit of the area in the rustic town of Sixt. I had been pre-warned to expect a lot of flat sections and even some uphill. With this in mind, I chose to make the skibike my weapon of choice, if there was walking to do, let it be in my comfy snowboard boots. Heading left from the top station of the Grandes Platiers cable car you need to go flat out without making any turns along the Serpentine piste. Should you have to make an emergency stop you will have a lot of walking to do. After a mile or so the sign appears for the start of the Les Cascades run. This is it, you are committed to a 14km run with no reasonable option of turning back should you change your mind, no alternative chairlifts or drags, no buses, no first aid posts, nothing, nada, diddly squat. The run starts in an immense bowl that gradually narrows as you progress, simultaneously the gradient increases as you are funnelled into the start of a deep gorge. I did some off piste and was surprised to find myself quite a long way above the piste in no time at all. Having rejoined the piste, I discovered that if you moderate your speed on one section, you are stuck with an uphill march to the next section. 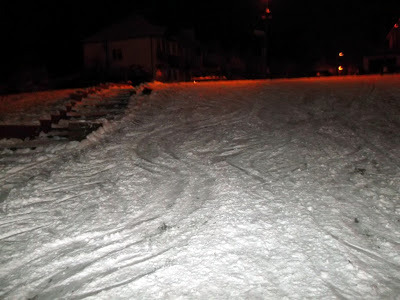 But the piste is twisty and with a roller coaster quality, it became apparent that most users were adopting a gung ho, attitude to avoid any walking. Like many others, I was caught out by a sharp right hand 90 degree turn, with a sudden drop off. Paul, who was some distance in front, told me that he arrived to a "yard sale" with family groups spread all over the place. I missed the spectacle, but went splat sideways into the netting, on arrival at the same spot. Quite a long way above the piste in no time at all. There were a few more such surprises to come, grim looking signs appeared warning you to not leave the trail under any circumstances and when a section of safety netting appeared alongside the trail I realised why. The piste was now following a narrow ledge with both cliffs above and a vertiginous drop into the gorge below. With Sixt coming into view the final section was a pretty horrible, narrow, icy descent for the last mile. It caught me unaware and I had to resort to side slipping for the last bit. Not good form, but I didn't want to collect any more bumps or bruises. Safely back at the free shuttle bus stop with a few fresh scrapes, Paul and I calmed our frayed nerves with a vin chaud and discussed the folly of Les Cascades being marked as a blue run. Red or black would be fairer according to the state of snow, etc. 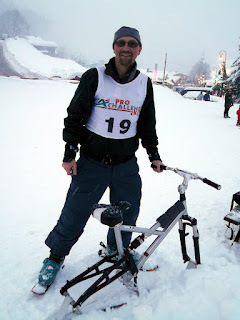 However, it was a great experience, I imagine I might have been the first freestyle skibike to make the run and would gladly repeat the experience. However it is not the best run for nervous beginners or those with low intestinal fortitude. After his day of rest, Paul was ready for some gentle ski cruising, I suggested Praz de Lys, just 30 minutes from our base camp at Cluses with a good selection of easy and pleasant runs. The perfect place for a lazy Sunday. We explored just about every available trail, we particularly noted that the map makes some of the pistes on the edge of the station look quite small and insignificant. 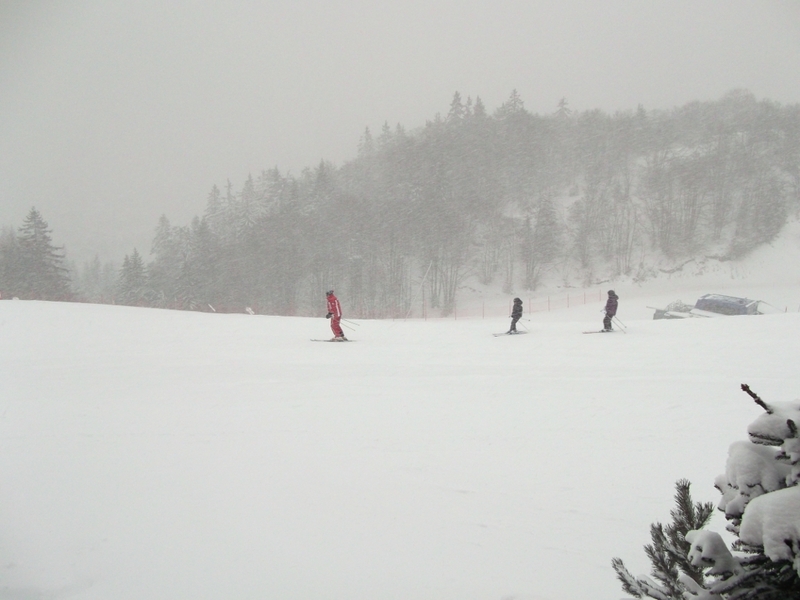 But in many ways these are hidden gems; long, fast rolling, runs with hardly a soul on them and no queues at the lifts. On one such section, we had a near miss. 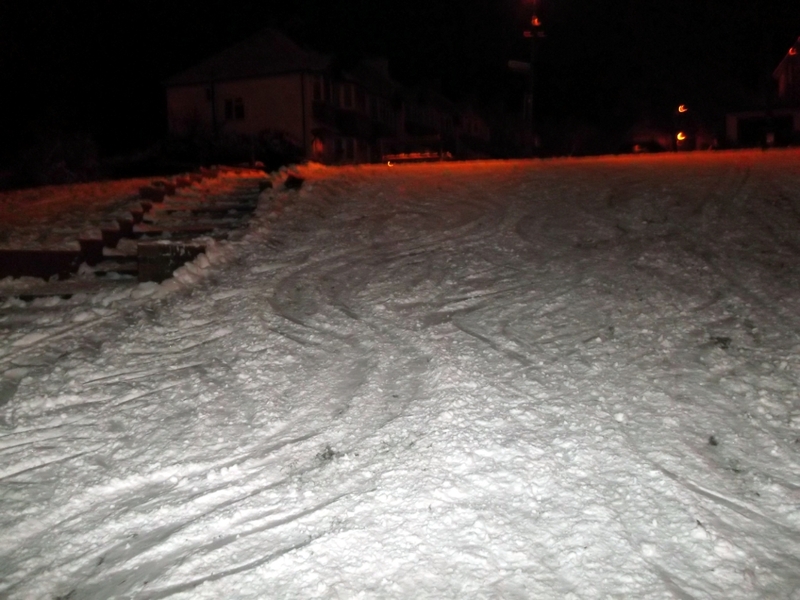 On an empty slope that must have been a kilometre long and a good 30 metres wide, the chances of two people crashing must be infinitesimally small, but put two Kinnons on the same slope and guess what happened next? Somehow we just avoided each other, but there was quite a clack as I skied over the tails of Paul's skis. 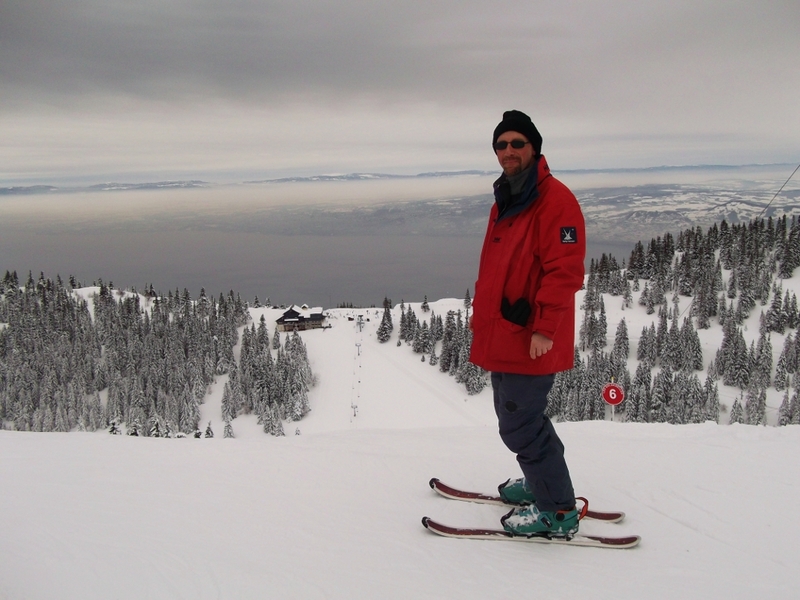 In the afternoon Paul wanted to relax a little so we split up and I switched over to the skibike. 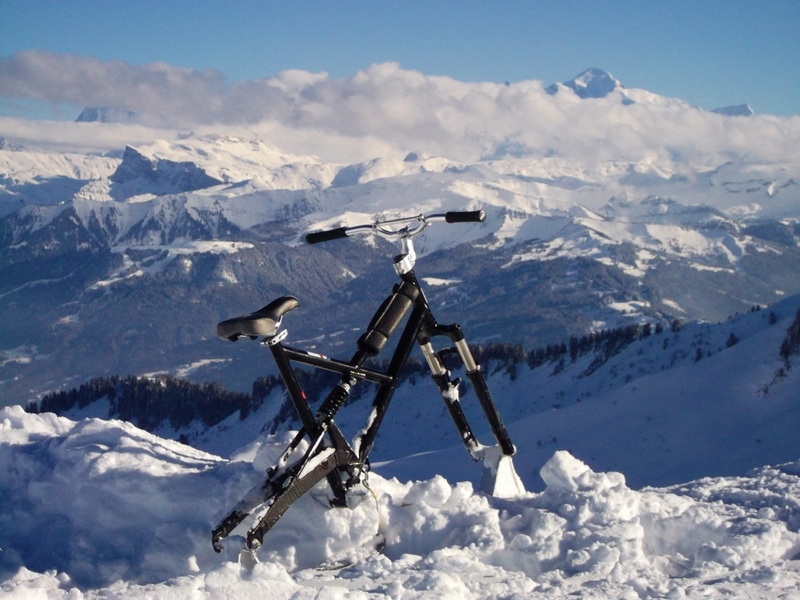 I had already established with the lift operators that skibikes are still accepted at Praz de Lys. But when I showed up the liftie mentioned something about feet, I think he was suggesting that skibike riding without footskis was dangerous, but ultimately, it was my choice. Praz de Lys - the perfect place for a lazy Sunday. I knew from the morning's skiing that some of the pistes were hard and icy, fine for skiing but hellish (for me) on a skibike, so I opted to do as much off piste riding as possible. The most satisfying to be found was in the bowl under the Haute Fleury chair lift. Exiting the chairlift to the right you can choose between red and black graded runs, I had just managed the red by skis earlier in the day, but it was pretty hard and icy. So I opted to avoid the piste and head into the plentiful, soft snow off piste. The first section is much steeper when you're on it than it appears during the ascent. So for my own safety I made some long traverses then stopped, lifted up the skibike to face the new direction, plonked it down and started again. No points for style, but a good survival technique. There were some rocky patches which all other tracks had avoided, so I picked a route around them, on the lower side you could see the reason why. Further down the terrain was much more gentle and it was simply a case off getting your weight well behind the saddle, flexing the legs a little, pulling up on the handlebars and letting the skibike go. Once you reach a critical speed the front ski rises through to the top of the snow and you surf along making gentle arcs in the direction you choose. What a late afternoon delight. Praz de Lys - late afternoon delight. This morning Paul was still a little frayed around the edges after yesterday's skibike lesson. He had planted his foot quite heavily whilst mid turn and thought that he might have torn an old operation scar; hence his choice to take a day off, sit in the spring sunshine and take it easy. With so little time left before my return to the UK, work and reality, I am becoming manic due to the need to make the most of every moment. As with previous year's SkiBiker SkiBike Blog Tours it is only during this final phase that the "wins" arrive, on a daily basis, as my mind and body come together and deliver confident skibike and ski technique. I wanted to revisit Les Contamines, a place I haven't seen for a couple of years and today was probably going to be the only remaining opportunity this season, with or without Paul's good company, in short I was gagging to go. Les Contamines is situated in a remote location, very close to the Mont Blanc and near the border between France and Italy, it is a long drive from Geneva and even our base in Cluses is still nearly an hour away on small provincial roads. The village is a typical Alpine town, in many ways not that different from the days when Victorians came to enjoy the thermal spas at neighbouring St Gervais les Bains and the local farmers eked a meagre living from dairy farming and small holding activities. There are two gondola telecabines providing uplift to the core of the skiing on the mountain above. 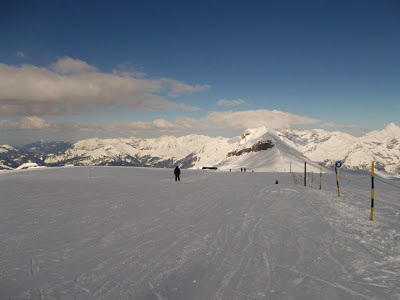 Many of the runs are of the fast, rolling, wide "motorway" style, much beloved of intermediate skiers eager to add more kilometres to their experience. I opted to start the day by ski, as I had a lot of ground to cover with the minimum of faff. I covered most of the available runs, luckily my memory served me well and I hardly consulted the piste map. I also visited the "back mountain" area of neighbouring Hauteluce, also covered by the same lift pass. The last time I visited this area was in near total whiteout and we ran out of time to make it all the way down to the base station. This time things couldn't have been more different, the visibility was perfect and there are some fun runs without any crowds on the Hauteluce side of the mountain. The lowest level is served by a reasonably large sized telecabin, perfect for skibikes and looking the double of the one installed at les Carroz. I had repeatedly asked a number of different lifties what the situation was with skibikes and/or SnowScoots and they all said there was no problem. So with this in mind I headed back to the car park for a quick snack and a change of snow sliding systems. As the Contamines gondola lifts are of the old fashioned 6 seater (back to back) bubble design, I knew that a fully assembled skibike wouldn't fit. So to keep things stress free, I carried the frame and skis up separately and assembled them slope side. I then made my way further uphill via a couple of chairlifts, I was asked if I had a safety leash, but once I showed my system all seemed OK. However higher up I was stopped by a couple of older looking guys in uniform who explained that skibikes were "Interdit" i.e. 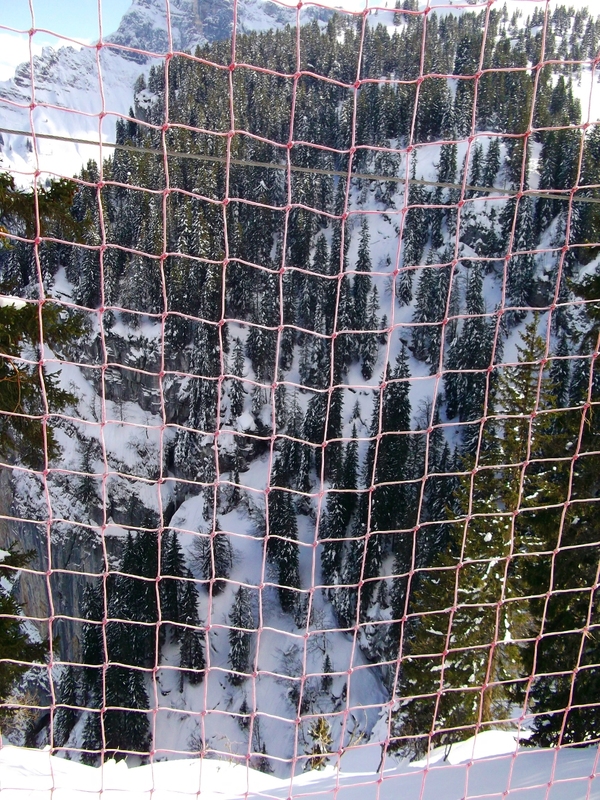 forbidden on the pistes of Les Contamines, I apologised (in French) and asked what was to be done? "Nothing" was their reply, after all it was 3:30pm and I was just short of the highest point at Les Contamines and had at least 1000m of descent at my disposal. I knew this.. they knew this... what could they do about it, arrest me? I headed downhill, as this was going to be my sole run I took there words literally and avoided the pistes, making a great effort to take a particularly circuitous route, mostly under the chairlift wherever possible. 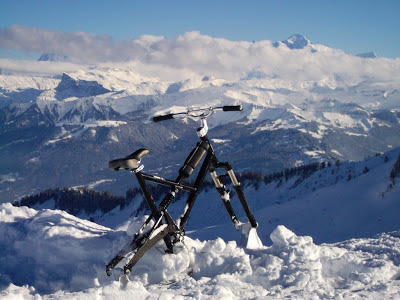 It is such a shame when a brilliant ski station like Les Contamines makes a U-Turn on their previous decisions, it is even more galling that SnowScoots are deemed to be ok, but a freestyle skibike that it is so similar, isn't. How does that compute? Les Contamines - SnowScoots are deemed to be ok, but a freestyle skibike isn't. It was forecast to rain this morning, so I was surprised to wake to heavy snow falling outside my window. The mountain tops were shrouded in the clouds, so it looked like visibility was going to be a problem, but there was going to be plenty of fresh snow to exploit. Paul has been keen to have a go at skibiking and has only a few precious days left before he returns to London. Furthermore, warm, dry and sunny weather is forecast for the next few days. In short, today was going to be the best opportunity for Paul to try skibiking in the 2013 season. 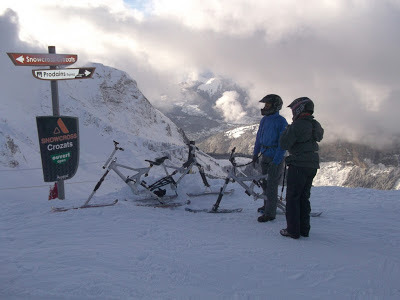 We headed to Les Carroz, it is only about 20 minutes from Cluses, is skibike friendly, has a good sized telecabin and lots of gentle blue graded runs through wooded areas. We assembled my two Marin based DIY skibikes, I showed Paul how they can be carried conveniently and safely "over the shoulder", then we got our lift tickets and headed uphill. Outside the telecabin top station there is a short steep hill that is always busy with passing traffic. I suggested to Paul that we should walk about half the way down so that he wouldn't have to do anything too tricky to start. Once out of the danger zone, I demonstrated how a beginner can traverse a hill, stop, lift the skibike around to face the other way and traverse back in the reverse direction. Further down, where the gradient was more gentle, I was able to show how you can make a skidded turn, using the "throw a leg out" method to aid balance. Paul seemed to take it all in his stride and I was rather envious of his ability to remain so tidy and determined to keep his feet on the pegs whenever possible. We practised the "hockey stop" technique in order to stop in an emergency. After that it was just a question of playing a bit of "follow the leader" and getting some more experience. Paul took a break in the afternoon as he found skibiking to be somewhat more physical than he had been expecting. This gave me the chance to head over the hill and play on the awesome deep fresh snow above Les Molliets. Picking my way either around or over the moguls, all the while avoiding the nervous beginner skiers and sundry other hazards, it suddenly dawned on me... 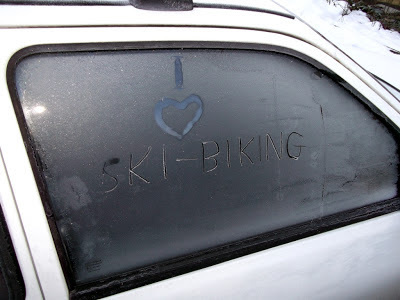 I have my skibike mojo back, Huzzah! 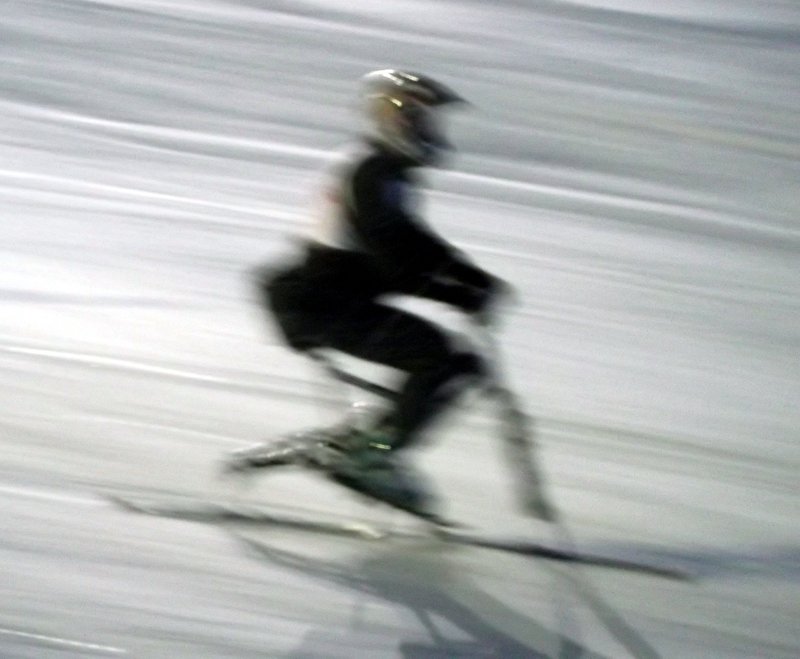 I have to confess I have been having a bit of a crisis of confidence in my skibiking after my washout failure at the Notre Dame de Bellecombe race night. In direct counterpoint my skiing has reached new levels of audacity, I don't know how good it looks, but it is working very well and feels great. Today Paul and I visited Thollon les Memises, a small ski station on the South side of Lac Leman about 30 minutes from Geneva. They haven't opened up to "Les Nouvelles Glisses" here, so skibiking is currently out of the question. 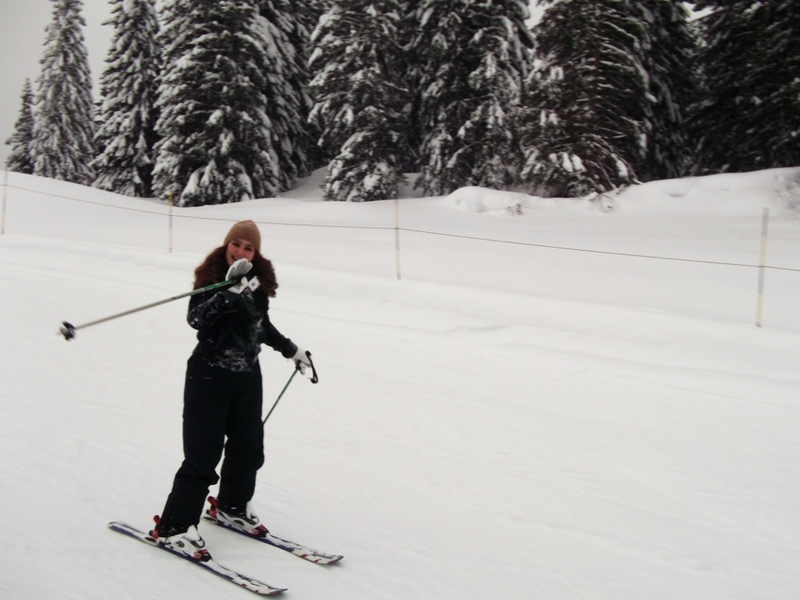 I had such a great day, whizzing around, just me and my little 99cm skis in total harmony. Could this be the end of my love affair with skibikes and skibiking? Could this be the end of my love affair with skibikes and skibiking? 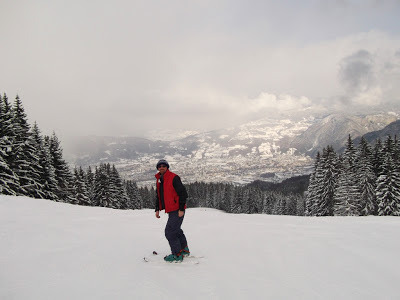 Due to popular demand from the readership, here is a summary of the last few days when yours truly turned to the dark side and played at being a ski instructor. My victim was to be my niece Sofia Kinnon, who had flown from her home in Guimaraes, Portugal, to join Tio Marco for a few days as a ski debutante. The first priority was to get Sofia kitted out with the necessary clothes. She had brought sporty clothes, but they looked to be a bit on the lightweight side for ski duties, especially for the inevitable day one crashes. We went through my wardrobe and supplemented her clothes with a chunky lumberjack style fleece and some sheepskin mittens, it was somewhat of a bizarre combination, but sort of cute in a "Tank Girl" way. 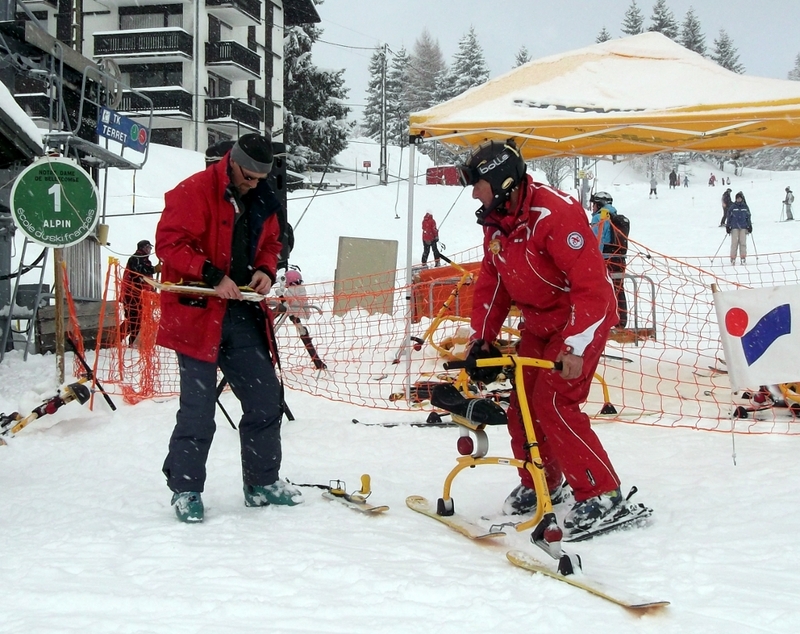 Next we were off to the Ski Clinic in Cluses to hire boots and skis, it is a little bit like Snow and Rock in the UK, i.e. quite a posh place, so not cheap, but filled with top quality kit. 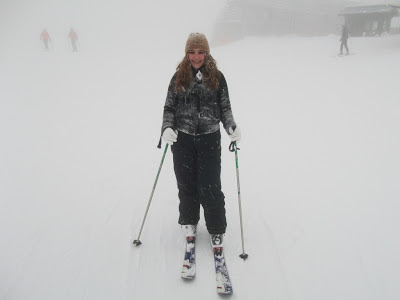 She was quickly measured up and provided with some very new looking ski boots, poles and excellent Head carving skis. So as not to waste any more time we headed to our nearest slope, Mont Saxonnex, just 20 minutes away, high up on Mount Bargy overlooking the town of Cluses. We sorted out a day ticket and began our lesson. The first task was just to practise walking in ski boots on the level, something I remember coming as quite a shock when you can't flex your ankles. Then it was time to clip on the skis and practise walking on the level, this was then evolved into using the herringbone "duck walk" step to climb uphill. Once some altitude was gained it was time to practise shuffling around and sliding back down in the snow plough position, familiar to anyone who has learnt to ski. The Ski Instructor - would you trust your teenage daughter with him? I felt sorry for Sofia, I forgot how tiring the combination of falling over, getting up and climbing can be when you first start, as she glumly commented, "I wish I had done those exercises you told me to do, Uncle Mark". 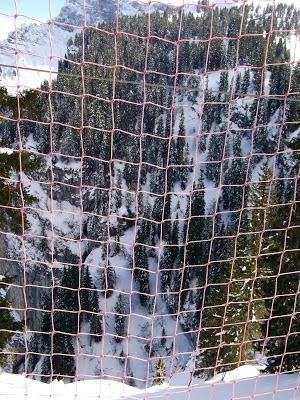 We had a little sit down and I pointed out how easy it is to focus on the skiing and forget about the view, the sun in a clear blue sky, the birds in the trees, the snow snakes..."The snow snakes?" she queried, "Yes" I explained, "They live under the snow and trip up unsuspecting beginners. Come on, let's try the easy way to get uphill". So next we worked on using the Poma lift, something, to my great surprise, that caused no issues at all, I wish I had found it so easy myself back in the day. We drove up to a higher level to watch people use the chairlift, Sofia had the choice to give it a try, but stated, "I don't think these electrical items like me very much, can we come back tomorrow?". 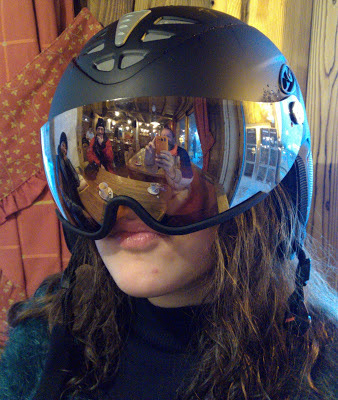 The following morning Sofia got a few upgrades; the local Carrefour supermarket yielded a pair of salopettes and some ski gloves for under €50. I also made a decision to try substituting the heavy, wood cored, Head carving skis for some shorter and lighter Salomon Crossmax T skis that I had picked up off eBay, just a couple of days prior to leaving for this trip. I was reluctant to use these skis at first as they appear to be designed very much as children's' skis. But as Sofia is under 1.6m high and weighs less than 50kg we gave them a go and both her technique and confidence were instantly improved. It remains a mystery why "Ski Evolotive" or the "Progression Method" is no longer used in France. But I suspect it has more to do with Marketing departments and brand promotion than sound teaching methodology. Sadly the weather couldn't be upgraded, I made the short drive to Praz de Lys, which was a bit tricky for the last 5km on steep snowy roads. In the poor visibility we practised using the much longer drag lifts there that lead onto some excellent, confidence boosting green runs. 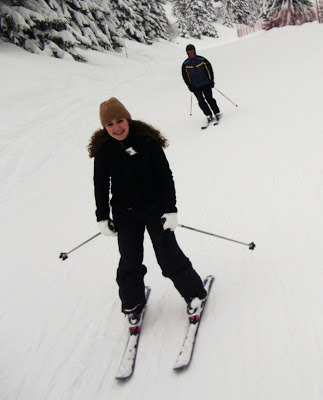 I made Sofia do a little training drill, by using the ski poles like handlebars, it limits excess upper body movement and forces you to ski with the legs only. This worked well, so we moved onto the first blue run, it was a bit deep and choppy in places and she missed a turn and skied off the edge into quite deep snow, collapsing in a yard sale of ski equipment. I dutifully headed over to dig her out, "Uncle Mark!, quick Help Me", came a feeble voice. Fearing the worst, I asked "What's wrong, are you hurt?". "No, it's more important than that", came the reply, "How does my hair look? Is my make-up running?" "How does my hair look? Is my makeup running?" We did a little more practise, but the light was failing and when Sofia told me her knee was hurting, I decided it was time to call it quits for the day. On the final day we made the trip to a "proper" Alpine ski resort, at the stunning cliff top town of Avoriaz. This also gave Sofia's mum a chance to travel with us, take a stroll around town and see the world her precious daughter had been initiated into. I wanted to demonstrate how to use a chairlift and as luck would have it, Avoriaz has a gentle 3 seater chairlift serving one side of the village. The lift operator dutifully slowed it down further, after I explained I was teaching a debutante. Paul helped me by lining up so that we were on either side of Sofia, at the time to get off we both stood up and lifted her into the same stance. Then we made a quick loop through town, back to the start for another go and then another still. My intention was to make it all feel run of the mill and not in the least intimidating. quick pit stop to liaise with Paul. 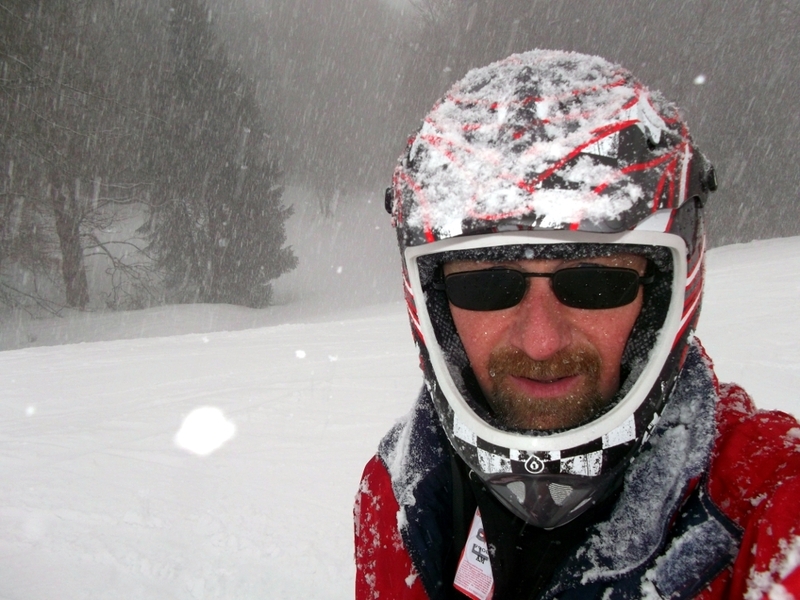 He warned me that the wooded runs down to Les Lindarets were a minefield of deep, heavy snow and moguls. This left us with just one beginner friendly option remaining, the long "Blue du lac" piste from the top of Lac Intrets, back to Avoriaz for the last run of the day. Unfortunately, the visibility was poor and getting worse by the minute. I hoped to get above the clouds for some late afternoon sun but this was not to be. Sofia and I made the slow descent in appalling foggy conditions all the way back down, literally picking our way from one piste marker to the next. Sofia did herself great credit not to grumble at "Loco Tio Marco" and just slowly follow behind me in foul weather which would have deterred some experienced skiers. We made it down safely for final quick scoot around Avoriaz town to get back to the giant cable car for our descent to our starting point at the Les Prodains car park. Apart from being a tremendous family bonding session, I really enjoyed introducing one of the youngest members of the Kinnon clan to the World above the snow line and especially returning her safely to her mother in one piece too. Sofia asked me how many people I had taught to ski, "One" I replied. "You mean one before me?" she queried, "No, just the one" was my reply. My sister in law and neice arrive later today, my niece, Sofia, will be learning to ski over the next few days with yours truly as instructor. I imagine the SkiBiker SkiBike Blog readership are none too interested in the fine nuances of the snowplough turn, hockey stop or side slipping. So you will excuse me if I take a brief hiatus from my reportage and rejoin you later in the week. Paul and I were so impressed with the ambiance at Notre Dame de Bellecombe that we decided to re-visit the area this morning to make a loop of the interlinked resorts of the Val d'Arly. Our plan was to begin at Praz sur Arly, then make our way via; Cret du Midi, Ban Rouge, Mont Vores, Mont Rond to the 3 different Notre Dame de Bellecombe areas. Then we would return via Mont Reguet, Flumet and the roc des Evettes all the way back to our starting point at Praz sur Arly. We only got going at 11am so it was a full on day to get round the loop, with no time for lunch, but we did manage a couple of Vin Chauds to keep us fired up. Skibikers please note, according to the information the lift operators gave me, skibikes and SnowScoots can use the lift systems, but anything that looks like a skibike will require the use of footskis (if only for uplift). I opted once again to make my exploration by ski, as there were a lot of awkward drag lifts and chairlifts to negotiate and no free time to mess about. 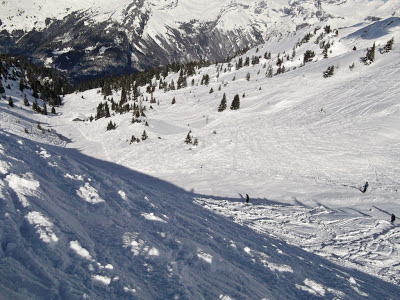 The domain is much larger than the size of the villages would have you think; there are 120km of pistes in the Val d'Arly alone and 185km if you add the adjacent runs of the Espace Diamant. 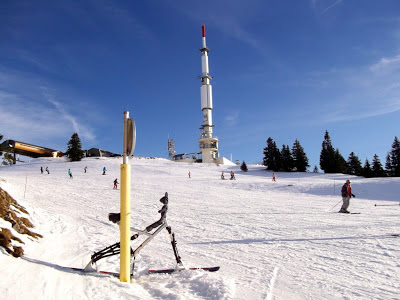 There are some reasonable vertical ranges of around 1000m or 300ft available, but some of the base stations are quite low, so the snow may not be the best at resort level. The hills have a pleasantly rounded "TeleTubbies land" quality, ideal for cruising blue and red runs. Advanced riders might find the area unchallenging in comparison with other areas nearby. A large amount of the runs are through pleasantly wooded areas that open up from time to time onto stunning panoramic views. Anyone who wants to cover large amounts of intermediate terrain without any nasty surprises will not be disappointed. Tourist development has been very sympathetically carried out, with no concrete bunker developments, most accommodation is in small chalet hotels and individual chalets. 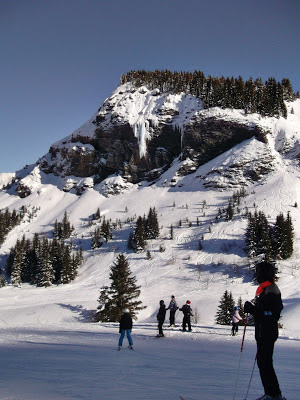 I would go so far as to say that Praz sur Arly has all the attractions of Morzine, but without the overcrowding and disproportionate amount of loudmouthed Brits. We arrived back at the car with aching leg muscles, with happy memories of our day going around the Val d'Arly. On the return journey to Cluses we stopped at an enormous hypermarket in Sallanches to stock up on provisions for the impending arrival of my sister in law Isolette and her daughter Sofia. 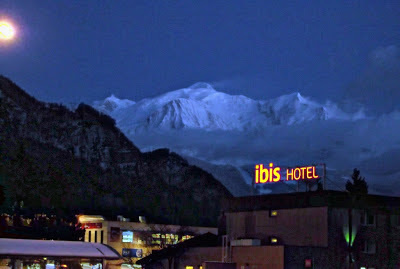 Leaving the bright fluorescent lighting of the shops, we emerged to a stunning moonlit view of the mountains and the Mont Blanc in particular, you don't see that down Tescos in Purley! Tonight was the first ever SnowBike race night to be held at Notre Dame de Bellecombe. I was invited along and was glad to attend, thinking that attendance would be low and I could add my support, although nothing could be further from the truth as I was to find out later. I was told it was to be a single marque Brenter only race, something that didn't bother me, I learnt on Brenter and have been back on them a couple of times since. Arriving at around 3 in the afternoon, I registered for the race at James Sport, owned by skibike enthusiast James Mollier Camus. I got myself a lift pass and located Ric Platt from SkiBike Ltd. who had arranged for me to get a Brenter. I was assigned my skibike and footskis and went up the hill to refresh my skibob technique. I put in a few runs and slowly the technique began to come back to me although to be honest I think I was doing a lot more skiing with my feet than skibike riding. Ric tracked me down after an hour and explained that there weren't enough hire skibikes to go round and could I do the race on my own. I didn't need any encouragement, but I retained the foot skis and hard boots for the drag uplift, the plan being to ditch the footskis for the race, I collected my race vest and headed up the hill. We were allowed to view the slalom course 30 minutes prior to the start of the race, I was pleased to see that it was in soft snow and not the usual boiler plate much loved by racing types. That bit done we had to wait above the start gate in our running order for the race to begin. It was a magical moment, sat high up on a floodlit hill in the soft snow waiting for the start of the race, the pa announcements from the village below drifting up whilst snowflakes softly descended all around us like a veil. So how did I do? If you want a quick summary - pretty dismal. I made my first run in 1 minute 13 seconds, the only person slower was ESF instructor James Mollier Camus who had crashed out, recovered and still made it down only 5 seconds slower. On my second run I crashed monumentally after the first gate when I could no longer hold the pedals in my slippery hard boots. 1. I am an irredeemably uncompetitive rider, perhaps it's time to quit racing? 2. 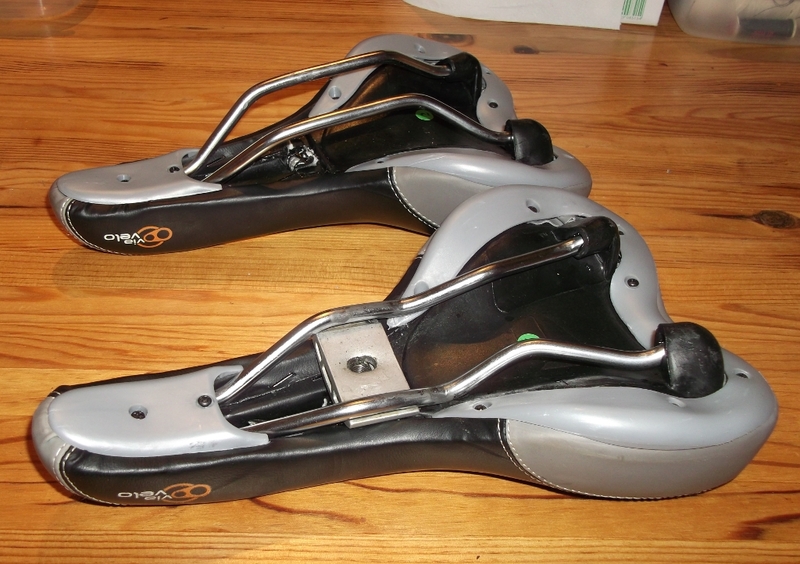 Riding a freestyle/pegger skibike with hard ski boots is bad news. My thanks go to the sponsors and organisers of the SnowBike Race Night at Notre Dame de Bellecombe, it was brilliantly well organised. There was some seriously good kit being given to all riders, no-one went home empty handed. I hope that this will be a regular event, although I might duck out of future engagements and stick to falling down ice waterfalls, which I seem to be better skilled at. Plus ca change with the weather today, there were a good couple of fresh inches of snow on the car overnight and the sky looked tempestuous. It looked like it was time for another local trip and nowhere too high or exposed. 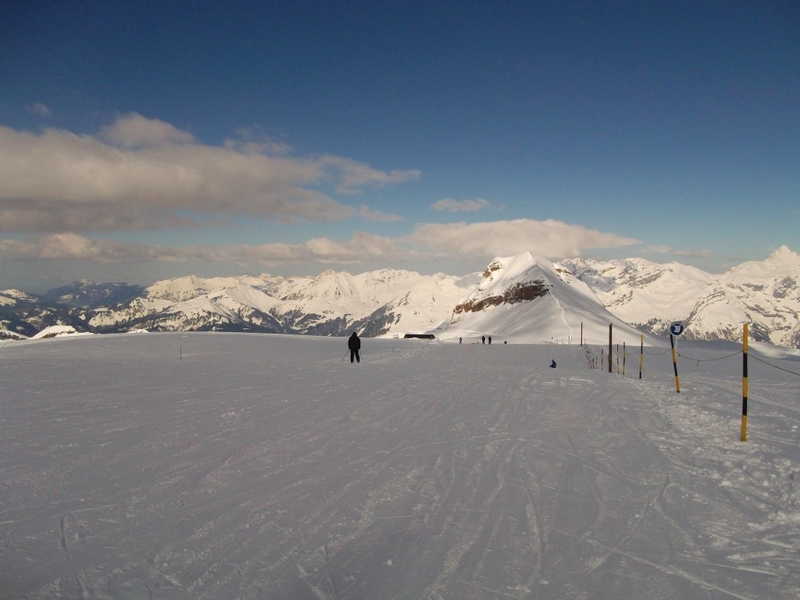 It was also to be another ski only day, as I am still waiting for my body to heal from my trip down the SnowCross Crozats run at Avoriaz. Skibikers please note that I should be making up for it tomorrow, when I head off to a Brenter SnowBike race night..
My choice was to visit Hirmentaz and les Haberes, almost adjacent to the Massif des Brasses visited yesterday. On the drive up the landscape looked like Narnia, with trees frosted with snow in a world of whiteness everywhere. 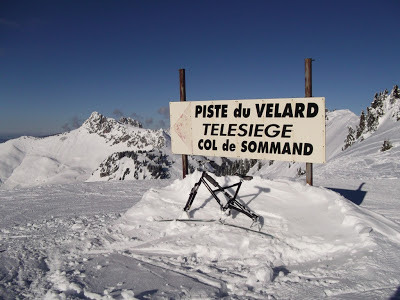 I just made it to the Telesiege des Souffles chairlift without fitting snow chains, but Paul made a prudent decision to make me fit them in anticipation of the journey home. Hirmentaz were running a school holidays special price for two of just €12.50 each, but don't get the impression that this is a two drag lifts and three runs type place. It has 43 pistes and 50km of runs, stretched across neighbouring les Haberes and even above la Glappaz. By lucky chance whilst I was buying the lift passes, 3 lift operators were shooting the breeze and I was able to confirm that there are no issues with skibikes or SnowScoots, the later can even use the drag lifts should they so choose. Hirmentaz is very well laid out in its valley location. A large chairlift acts as the core of the infrastructure, whilst beneath it and served by drag lifts are the nursery slopes. Further up the valley are areas better suited to more advanced skiers and riders. Off to one side are the expert runs, snow park and boardercross areas, whilst to the other side is the liaison with the wooded slopes of neighbouring les Haberes. The conditions were once again very stormy, with extremely low visibility and driving snow. We just made it over the ridge towards Les Haberes, but the weather was fearsome. 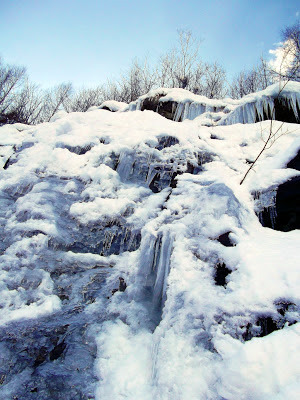 The snow in places had been stripped away to reveal bare ice patches, whilst elsewhere it had formed knee high drifts. This would have made challenging skiing, but in driving winds and almost zero visibility it took me beyond the limits of my ability. I got ample opportunity to perfect my ski a bit, do a head over heels, ski a bit more, do another head over heels, ski method. The runs down to les Haberes were much more pleasant once you had found some shelter amongst the trees. We did a whistle stop tour of the runs on this pleasant wooded side of the station before braving the high winds to return to our starting point and a snowy drive home. This morning the weather outlook hadn't changed much from previous days i.e. stormy and changeable, we decided to remain low and find pistes sheltered from the wind. My choice was to revisit the Massif des Brasses in the Valley Vert, an area that appears to be known only to the savvy locals. You rarely see a car with a UK registration and definitely not a Range Rover. Our closest access point was just a stones throw from the oddly named town of Onnion, close to St. Jeoire and under 30 minutes from our base in Cluses door to door. Arriving around 10 in the morning at the Chenevieres chairlift I was surprised to see the ticket office closed. But at times of low demand you pay the lift operator for a self-adhesive ticket, designed to be worn on a metal paper clip thingy attached to a convenient zipper, a system I have only seen used in Scotland before. Indeed the topology of the area is very reminiscent of Scotland too, with rounded and rolling hills, interspersed with both coniferous and deciduous trees. The weather was most definitely Scottish flavoured too; my cousin Paul, somewhat of a fair weather skier, was put off by the level of extra sensory perception needed to ski in whiteout. We were also treated to the full menu of meteorological options; snow, wet snow, hail, rain and even a dust devil or should that be a snow devil?. There were brief spells of clement weather on and off, even a brief glimpse of blue sky at one point. This was when we both opened up the throttle and thoroughly enjoyed ourselves. There are a good selection of intermediate runs available, but both beginners and experts might find themselves limited for disparate reasons. Even the red runs here might be only graded as blues elsewhere. There is only the one black run and the drag lift serving it appeared to be unmanned during our visit. Like so many of the other smaller ski stations in this area the Massif des Brasses is such good value at just €18 a day. The price for refreshments are reasonable (for France) too, €2.50 for a very fine Vin Chaud (mulled wine) at the restaurant Chaine d'Or. For this visit I was on skis, but when I last visited in the 2011-12 season and was able to ride my skibike without restriction. There are 3 chairlifts, one of which is a detachable, with slow loading and unloading speeds, perfect for the skibiker. The others are of the older style and one is just a two seater, not an impossible prospect, but you would benefit greatly by having a chat with the liftie first. They seem to be accustomed to slowing the chairlifts for utilitarian purposes; I saw rubbish bags, pedestrians and a school party heading down on the lift. The soft conditions and extensive off piste would have suited the skibike and I may yet return to give it a spin. If you happen to be in the area and want some simple skiing, snow boarding or even ski biking then when the conditions are right the Massif des Brasses is a winner. Last night was yet another stormy one, I was awoken around 4am by the sound of the wind rattling and banging the metal shutters on the apartment block windows. At first light it became apparent that there were a couple of inches of fresh snow even right down here in the shelter of the valley. My morning shower revealed an interesting selection of bruises including one within an inch of my "meat and two veg". After yesterday's rough and tumble I needed a break from skibiking and a chance to give my legs a workout, in short, it was going to be a ski only day. With the wind, snow and poor visibility it looked like we needed South facing slopes with sheltered runs below the tree line. 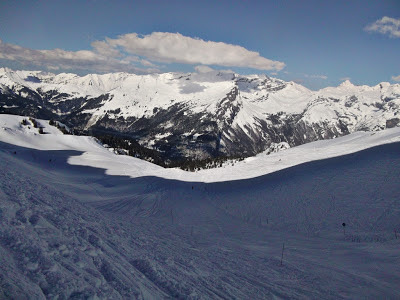 This is quite a rare combination, most of the slopes in this part of the Alps are North facing to reduce the detrimental effects of the sun on the snow. The database sitting in my head suggested that Praz de Lys may be the ideal place. So whilst the winds calmed and the snowfall reduced, Paul and I made a morning visit to McDonalds for a coffee and a chance to leech some of their wonderful free wi-fi service. 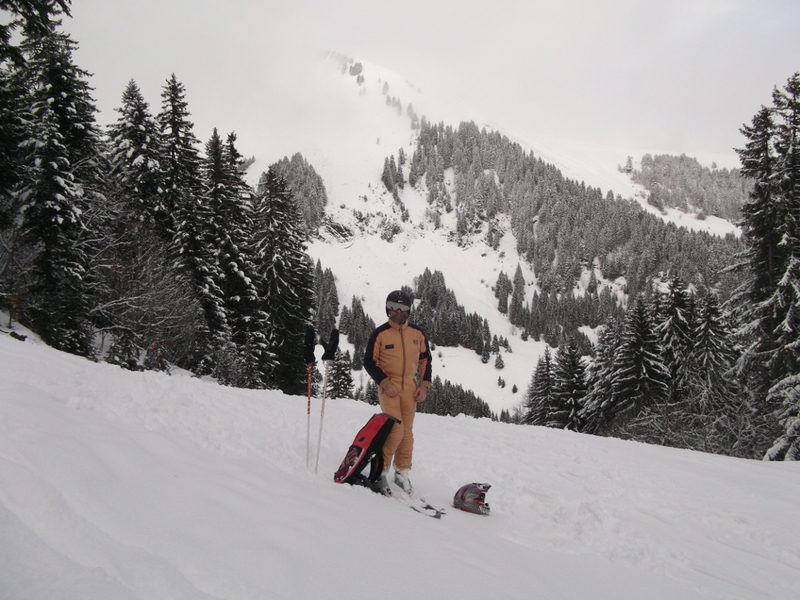 Internet chores accomplished, we geared up and headed for Praz de Lys, just 30 minutes from Cluses. On arrival we found it to be virtually deserted, no doubt due to the extremely poor visibility. We headed high up to the peak of Haute Fleury into total whiteout, coming back down at a snails pace trying to head from one piste marker to the next. Back at our starting point we consulted the piste map and identified what looked to be some interesting tree lined runs further down the hill served by the Veran and Praz l'Eveque chair lifts. Within the trees it was much easier to sense your speed and direction, there was also a good depth of unpisted snow in places. I really enjoyed the sensation on tiny SnowBlades, but it came as a bit of a shock to my cousin Paul on his vintage 2m long straight and skinny skis. Late in the day the visibility improved enough for a rapid descent from top to the base station, ducking in and out of the clouds on the last run before it was time to head for home. 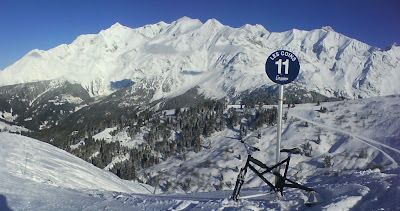 As of last season (2011-12) it was possible to use skibikes at Praz de Lys and the general attitude seems pretty relaxed. 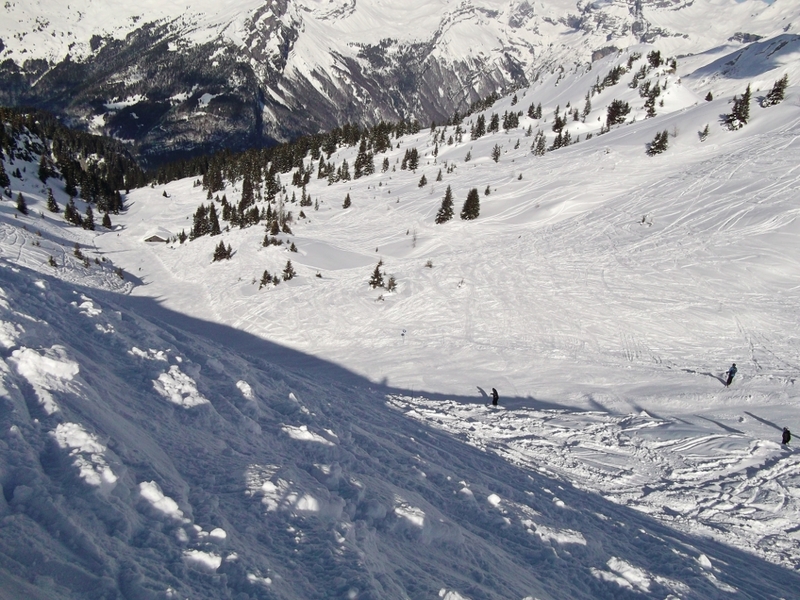 There is plenty of variety and in such good conditions, a good amount of off piste too. The infrastructure is biased towards chairlifts, which is good news for skibikers. But some of them are the older type that tend to sweep you off your feet and spit you out at the other end. But Praz de Lys is very good value at around €20 a day for a lift pass, with discounts for skiing after 11am or finishing before 1pm. Once you have exhausted the runs at Praz de Lys you can head over the hill to neighbouring Sommand and explore further. It should however be noted that a lot of the runs are South facing and the station is at quite low altitude. Pick a good day to visit and enjoy some great value, unpretentious winter sports, whether it is on skis, snowboards or skibikes.